Beep beep beep! Beep beep beep! Before the days when cellphones started interrupting our lives, there was another form of instant messaging system called paging. Mobile phones have made pagers less popular than they were in the mid-1990s, but paging (or radio paging, to give it its full name) is still a vitally important form of sending messages—especially for doctors and emergency workers. Let's take a look at how it works! Artwork: Pagers that could display full, alphanumeric text messages first became popular around 1990. Broadcasting (sending instant information to hundreds, thousands, or millions of people at a time) is the big idea that made radio and television so powerful. But what if you want to send a message to only one person? You can certainly send very personal messages over the radio: think how people get their favorite DJs to read "happy birthday" messages out on air. That's instant communication and it works fine if the recipient of the message happens to be listening—but it's a bit hit and miss. And it can be irritating for the other two million listeners who have to "tune out" this irrelevant information that has nothing to do with them! Photo: A modern Motorola Bravo pager. This one has a two-line alphanumeric LCD display and scrolls messages from right to left or up and down, as you prefer. It can either receive pages silently and discreetly, or it can signal a new message by vibrating or beeping. It runs off a small AAA-type battery that goes in the slot at the bottom and provides about a month of power. A pager is a small personal radio receiver that you carry around in your pocket. You have a personal code number or phone number and anyone who wants to send a message to you dials or quotes that number with the message they want to send. That puts them through to a switchboard at a central message broadcasting office, where a person (or more likely a machine) immediately sends out the message with thousands of others, just like a normal radio broadcast, using a network of radio transmitting antennas. All the pagers in people's pockets are constantly picking up all the messages being sent out, but your personal pager ignores any messages that don't contain your personal code. Once a message comes through with your code, your pager buzzes or beeps and displays the message with the date and time. A page is simply the message or alert sent to or received by a pager and encoded in a burst of radio waves. Back in the 1950s, the first pagers used a crude system called two-tone, in which each pager was designed to respond to a page consisting of two unique sound tones (beeps) sent in rapid succession. If someone paged you, you heard your pager beep twice and you knew someone wanted to talk to you, but not who or why, so you then had to telephone your office or home to find out more (or, in some systems, plug in an earpiece to receive a voice message). Systems like this could be used to contact a maximum of 870 different pagers, which was fine in those days, when the technology was still very new. By the 1970s, pagers had been improved to use a system called five-six tone, so they responded to a unique code carried in a series of five or six higher-pitched radio frequency tones, with each one lasting 33 milliseconds and an entire page taking about 200 milliseconds (a fifth of a second). Systems like this could support between 100,000 and a million pagers. Pagers that receive actual messages (rather than simply beeping to alert you) work in a different way, typically using one of two standard page formats (or protocols) called POCSAG or FLEX™. 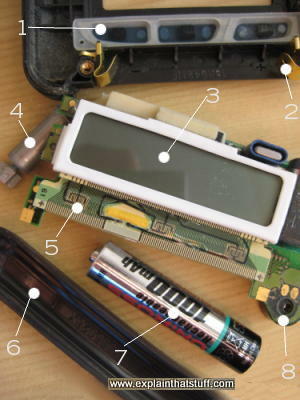 POCSAG (named for the UK's Post Office Code Standardisation Advisory Group, which invented it) can support up to two million pagers and arranges them into a number of different groups that are either "sleeping" (in a battery-saving mode) or "woken up" (ready to receive messages). To send a message to a particular pager with POCSAG, the system first transmits an initial "wakeup" message to activate every pager in the same group and then sends data to them in chunks called frames, with each pager extracting only the messages specifically addressed to it. FLEX™, developed by Motorola, is a newer and much higher-speed paging system that does away with "wakeup" messages by getting pagers to scan for pages at predefined intervals. This makes better use of the airwaves and reduces battery consumption (which means pagers can be made much smaller). According to Motorola, FLEX™ can support over five billion pagers. Three rubber membrane buttons (work in a similar way to a cheap computer keyboard. We're looking at the buttons here from underneath. Vibrating alert: A small electric motor vibrates because it has an uneven piece of metal attached to its axle at the top. As the motor spins around, it wobbles about like a badly loaded washing machine—and that's what produces the vibrations you feel. Main circuit board. Most of the (relatively few) electronic components are on the bottom of the board (and not shown in the photo). Removable battery flap. Like the rest of the case, it's made of a tough, shatterproof plastic. 1.5 volt battery. You can certainly use a rechargeable battery in a pager, as I am here, but it won't last anything like as long—maybe a week or two compared to a month or more for a conventional battery. One of the great advantages pagers have over cellphones is that their batteries last much longer, so you can carry them without worrying too much about charging. Small loudspeaker gives an audible alert when a message is received. There are two different kinds of paging: limited range and wide-area. As the name suggests, limited-range paging sends messages over a relatively small area using a low-powered transmitter. It's perfect for sending emergency messages to all the doctors in a hospital, for example. Wide-area paging is more like national radio broadcasting. A system of radio transmitters sends pager messages across a whole country in hopes that you'll be somewhere near one of them. In the UK, for example, the wide-area paging network uses something like 500 transmitter antennas—more than enough to cover a country that size. How do pagers compare with cellphones? You might think the big disadvantage of paging is obvious: it's a one-way form of communication. 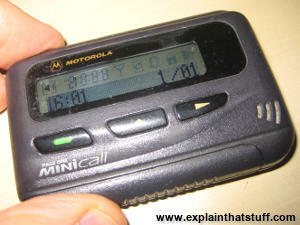 If you receive a pager message, you probably have to find a telephone to call back and find out what's going on. But pagers are not really meant to be competing with cellphones: they have a very different purpose—receiving quick, instant messages—and for this they're often much more efficient than phones. Incidentally, two-way pagers (which allow users to indicate that they've received messages) have been widely available since 1995. What's so good about pagers? One big advantage is that they send messages with VHF (very high frequency) radio signals, typically broadcast in the range 138–466 MHz (similar to normal FM radio programs). Using high-frequency radio means the signals reach further, need fewer transmitters, and suffer less from interfering obstacles than cellphone signals. You're much more likely to receive a pager message in a remote area than a cellphone call or text message, where you may not even pick up a signal. (That's why pagers are often used by mountain rescue teams, emergency workers, and lifeboat crews.) Unlike cellphone SMS text messages, wide-area pager messages are typically broadcast and received within 30 seconds. Messages sent over local paging networks, such as those operated by hospitals for their doctors, can be sent and received within five seconds. (Compare that with SMS text messages that can take minutes, hours, or even days to get through if there's congestion on the networks.) It's true that pagers are generally designed for one-way communication, but the lack of a radio transmitter makes them very suitable for environments such as hospitals where mobile phones may be dangerous to use (because their transmitters could interfere with medical equipment). A big drawback of using pagers is that, if you don't receive a message (because you're out of range or your pager is switched off), there's no way either you (or the sender) can find out about it. That's very different from SMS text messaging (where the sending system will keep trying until the message finally gets through) or email (where undelivered messages bounce back sooner or later). A good practice with pagers is for the sender to keep resending the same message periodically until the receiver finally responds. So if you give someone your pager number, tell them how to use it at the same time, especially if you're mainly using your pager for emergency contact: "Keep on paging me until I respond." Artwork: Just as with computers and cellphones, pagers gradually became more compact and convenient. But in the 1980s, when device size and battery life were still problematic, companies such as Motorola toyed with pagers that had separate receiver and display units. This one has a belt-type main unit (blue, 18) that receives messages from the central transmitter (green, 12) before relaying them on, wirelessly, to a separate wristwatch-type display unit (red, 22). Artwork from US Patent #4,803,487: Portable communications receiver with separate information presentation means by David Willard, Motorola, courtesy of US Patent and Trademark Office. 1921: A primitive form of paging is pioneered by the Detroit Police Department, who use radio transmitters to send alerts to squad cars. 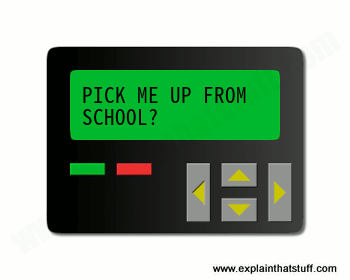 1949: Canadian inventor Al Gross (1918–2000) invents the first telephone pager. He had already invented the walkie-talkie (in 1938) and Citizen's Band (CB) radio (in 1948). 1956: The Motorola electronics company invents the first portable paging device: the Handie-Talkie radio pager. It is soon taken up in hospitals and factories. 1974: Motorola introduces the Pageboy I, the first commercially successful pager. It's followed by the even more successful Pageboy II. 1981: The UK Post Office introduces a powerful standard format (protocol) for delivering pager messages called POCSAG (Post Office Code Standardisation Advisory Group). Much revised and improved, it remains in use today and can deliver data at rates ranging from 512–2400 bits (binary digits) per second with support for up to two million addresses (unique devices). 1983: Motorola introduces Golay, a proprietary digital paging system based on POCSAG and binary Golay Sequential Coding (GSC) (named for physicist Marcel Golay). It has built in error correction and allows pagers to respond more selectively to messages, so their batteries last longer. 1986: Motorola develops the Bravo numeric pager. It soon becomes the world's best-selling paging device. 1990: The European Union agrees on a Europe-wide paging protocol called ERMES (European Radio MEssage System) with a delivery speed of 6250 bits per second. 1993: Motorola announces a powerful new high-speed paging protocol called FLEX™, which can send data at up to 6400 bits per second and support up to five billion addresses (unique devices). 1995: Motorola extends FLEX™ into a two-way system called ReFLEX™ and introduces the first two-way pager (the Tango). 1996: Skytel announces a pager that can send and receive emails. Later the same year, Research in Motion develops the rival Inter@ctive Pager, an email-capable pager that evolves into the Blackberry. Paging Protocols by Jay Moskowitz, Real Time Strategies. A very detailed technical introduction comparing how the various paging protocols (such as two-tone, five-six tone, POCSAG and FLEX™) actually work. Introduction to Paging Systems by Lawrence Harte. Althos, 2004. Cellular Telephones and Pagers: An Overview by Stephen Gibson. Newnes, 1996. The Consumer Electronics Hall of Fame: Motorola Advisor Pager by Brian Santo. IEEE Spectrum, January 3, 2019. Looking back at the groundbreaking, alphanumeric pager. Japan's final pager provider to end its service in 2019: BBC News, December 4, 2018. Though valued by doctors and emergency workers, pagers are heading for the door. Pagers: 'Basic technology but really important': BBC News, May 12, 2017. Why do emergency rescue workers favor pagers? Obituaries: Al Gross; Invented Pager, Walkie-Talkie and Cordless Phone by Elaine Woo, Los Angeles Times, January 14, 2001. With 2-Way Pagers, Messages Become Pocket E-Mail By Marty Katz. The New York Times, August 13, 1997. Before Blackberries and smartphones, two-way pagers offered a crude, low-cost form of email. Teen-Agers' Beepers: Communications as Fashion by Jonathan Rabinovitz. The New York Times, March 8, 1991. Remember when pagers were everywhere in the 1990s? If not, this article from the Times archive will take you back. 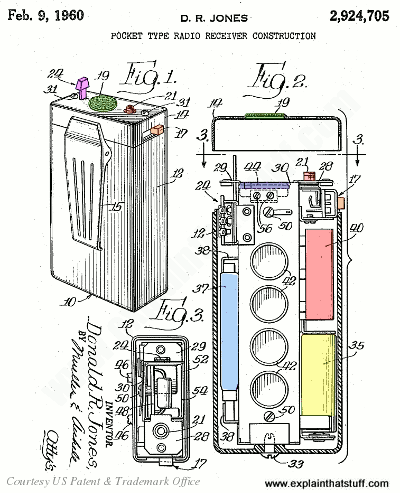 US Patent #2,924,705: Pocket type radio receiver construction by Donald Jones, Motorola. February 9, 1960. A detailed description of an early 1950s pager system and the receivers it uses. US Patent #3,575,558: Telephone paging system and method by Edward Baker, et al, Bell Canada. April 20, 1971. A detailed description of a typical 1970s pager system. US Patent #4,803,487: Portable communications receiver with separate information presentation means by David F. Willard and Philip P. Macnak, Motorola Solutions Inc. April 30, 1987. A late 1980s pager with a separate receiver and wristwatch-like display unit. US Patent #4,885,577: Paging system for providing a data message and a voice message to a unique address of a paging receiver by Leonard E. Nelson, Motorola Solutions Inc. December 5, 1989. One of the patents covering Motorola's use of Golay coding. US Patent #5,475,863: Method and apparatus for delivering messages to portable communication units by Floyd Simpson et al, Motorola Inc. December 12, 1995. Describes Motorola's two-way paging technology, as used in the ReFLEX™ system. 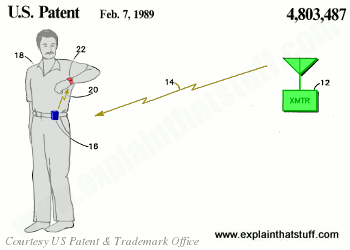 US Patent #5,754,119: Multiple pager status synchronization system and method by Michael and Joan S. Deluca, Motorola Inc. May 19, 1998. Describes how one person can use several pagers at the same time and have messages correctly delivered to the right one. FLEX and ReFLEX are trademarks or registered trademarks of Motorola, Inc.